The game's not over, yeaaaaaah...as Sega Rally takes a few strong laps on the PSP. Very long easy right, baby! Remember when you first bought that Sega Saturn system and felt that you were duped by a lack of superb software? Yeah, but then Sega had that one killer Christmas where they had three must-have games out at the same time- Virtua Cop 2, Virtua Fighter 2 (classic) and, my personal favorite, Sega Rally. This racing game was (and still is) one-of-a-kind, a simplistic yet utterly enjoyable off-roader with all of its arcade nutrients fully intact. Well, Sega's revitalized that with a more realistic flair this time around, rejuvenating the franchise with the release of Sega Rally Revo. Believe it or not, it's actually a pretty cool racer for the PSP, despite a couple of glaring flaws. 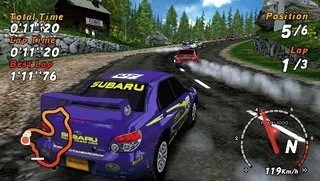 The home version is put together by Bugbear Interactive, the same team that brought the destructive FlatOut series to life. Here, they do the same kind of thing, but without the scurry of car parts. That's okay, though. By doing this, they retain the great feeling that the original Sega Rally was known for. Each car handles beautifully, even if some of them are a bit faster than others. Better still, track details are significant throughout the game, with tracks staying in place even after you've gone through them the first time around. The variety of tracks only have certain locales, but they look beautiful, thanks to a simply flawless frame rate and lots of attention to detail. It's a sweet looking game. Back to the handling. The way that the cars go into powerslides around mud slopes and snowy hills feels just like the real thing, while the game still retains that "Sega Rally" feeling. It's an amazing mixture. Our only complaint in this department is how the cars perform differently but don't have their own individual stats. It's like a car dealer being asked to explain the difference in performance between two cars and he just snickers and shows you the ticket price. As for sound, meh. The music's alright and the sound effects deliver, but the announcer has changed drastically. What the hell? Why couldn't we get the same fruity, mispronouncing guy from the first game who mistook the word "Maybe" for "Baby"? Here, the guy sounds like a robotic cousin of Dave from 2001: A Space Oddysey, but nowhere near as interesting. Someone shut him up. 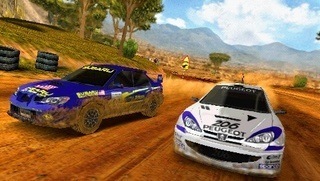 Along with a boisterous simgle player mode with dozens of tracks to race on, the game also has superb multiplayer support. Not only does it have ample Game Sharing options, but it also supports up to four players through AdHoc and Infrastructure. All these games run smoothly enough, although the loading can be quite a chore. Sometimes you're waiting thirty seconds-plus just to get a race started, something your impatient friends may not be so steady on waiting on. But I digress. The point of the matter is that Sega Rally Revo brings the series back to life without dumping what made it so damn crucial in the first place. Sure, the announcer needs to go and the car performances should've been better judged, but the racing -- the tried and true racing -- stays the same. Love those visuals, too. And the fact that "Game over yeaaaaaah" made it is pure Sega love. So what if they've forgotten a few things? They remembered the important stuff, like the joy of going into a mud-slide and trying to catch back up by leaning into it. That never gets old, I don't care how bad a driver you are. What's Hot: Superb track design and utterly realistic handling (despite bouncing off the walls); luscious visuals; great multiplayer. What's Not: Loading time is longer than we'd like it to be; the game's somewhat easy overall, announcer is stupid now..